Lionheart Interview 1/17/08 Political Vindication Radio, 1/18/08 The Gathering Storm — 1389 Blog - Counterjihad! 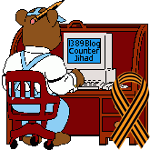 Lionheart is a counterjihadist blogger who faces prison if he returns to the UK. Listen to the voice which is about to be silenced! Lionheart was interviewed by Atlas Shrugs last year. Listen to the interview here. There is an interview by Phyllis Chesler at Right Truth. Listen to the nearly famous Gathering Storm Radio Show, that AlwaysOnWatch and I co-host. The show broadcasts live every Friday for one hour at NOON, Pacific Time. Friday, January 11: This week’s guest will be Eric Martin – Narrator of the documentary Jerusalem Countdown and What Every American Needs to Know About the Koran. Mr. Martin will discuss LionHeart’s situation and is a Middle East Expert. The call-in number again is (646) 915-9870. Converse with my co-host and me, chat with our guests or if you must, just air your spleen! This a great resource post – we all need to pick up our phones and support Lionheart during these interviews. Up off the couch, people – Britain may be lost but America will never suffer such an outrage quietly! 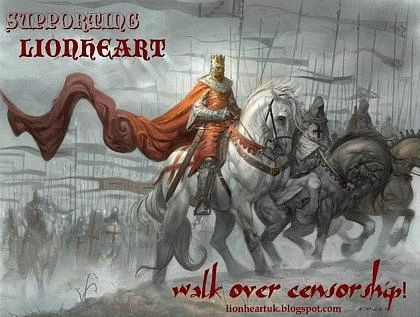 Lion heart will not be on our Gathering Storm Radio Show 1/11 show. We have moved him to 1/18. Just so you know….On this week’s edition of The Gathering Storm Radio Show WC and I will be interviewing one of LH’s close friends–Eric Martin, who will be discussion LH’s situation. We also plan to have journalist Lee Kaplan, who has some additional insights about LH. Kaplan, BTW, is connected with Rachel Ehrenfeld, who herself is undergoing what amounts to censorship from the judge’s bench–in New York. Next post: Foehammer’s Anvil website taken down – again!